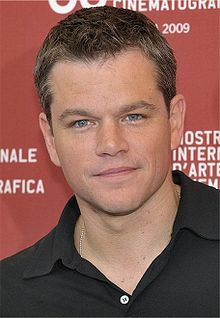 Matt also revealed he and his wife Luciana Barroso - who married in 2005 and raise four daughters, Alexia, 14, Isabella, six, Gia, four, and two-year-old Stella, together – are planning to move to Los Angeles from their current home in New York, although they are conflicted about the decision. He said: "Basically all of our friends with little kids are out there. We're a little conflicted. We love it here, we're really happy here and New York will always be here. It might just turn out to be a little jaunt out there and then a return.... It's hard to leave here." While Matt tries to emulate Brad, he previously admitted he is relieved he didn't fall for a fellow celebrity like Brad did Angelina Jolie. Speaking about his marriage to former barmaid Luciana, he said: "I got lucky. I fell in love with a civilian. Not an actress and not a famous actress at that. Because then the attention doesn't double-it grows exponentially. "I look at Brad-and I have for years-and when I'm with him I see the intensity of that other side of it. And the paparazzi and the insane level of aggression they have and their willingness to break the law and invade his space-well. "I wonder about that trade. I remember telling him that I walk my kids to school, and his face just fell. "Because he should be able to do that, too. And he can't." Lynn and Rick Bynes launched a bid to gain control over their troubled daughter's personal and financial affairs after she was placed under an involuntary psychiatric hold last week for attempting to light a fire in a stranger's driveway but they have made it clear they just want her to get well and are not attempting to take her fortune. A source told the New York Daily News: “The goal is to get her treatment, either through the courts or some other way. That's the only goal. Meanwhile, Kris Jenner -who manages her reality TV star daughters' careers – praised Amanda's parents for hiring respected attorneys Tamar Arminak and Patrick Reider, and officially applying to gain legal control of the actress's personal welfare and financial affairs following her downward spiral. She said: "This is something that, for me as a mom, makes me very sad, but happy that she's getting perhaps the help that she needs for one reason or another. "I've always said, 'I don't know what goes on behind the scenes, I'm not there, I don't want to be the one who's quick to judge, you know, and be real negative.' I like to look at the glass half full. And so I'm really glad that, whatever's going on, this would be the start of a new beginning for her."